Our main research project addresses the question of how we come to feel that we own our body. This question is fundamental because the feeling of body ownership is a basic aspect of self-awareness. Our goal is to identify the multisensory mechanisms whereby the central nervous system distinguishes between sensory signals from within one's own body and those from the environment. The long-term goal of this project is to develop a physiological model of the central representation of an individual's body. We are currently extending this line of research to include questions related to how we experience ownership of an entire body-as opposed to fragmented parts-and how we sense its location in the world. We are also interested in how central body representation influences other higher cognitive functions, such as episodic memory, visual size and distance perception, and affective feelings toward the body (embodied cognition). Our core line of research focuses on the question of how we come to feel ownership over our bodies. This problem can be formulated in terms of a multisensory binding problem: how is visual, tactile, and proprioceptive information combined to perceive a single coherent object that is one's limb? We also want to improve our understanding of how we come to experience an entire body as our own and how we perceive the location of this body in the world with respect to environmental landmarks. Another line of questioning addresses how the brain represents the position, force, and movements of limbs, as well as how a sense of being in voluntary control of one's actions (sense of agency) is generated. Moreover, we are interested in learning more about how mental imagery can influence basic multisensory perception and how the brain knows the difference between internally produced thoughts and real percepts produced by events in the external world. Finally, we want to investigate how central body representation influences other higher cognitive functions, such as one's ability to recall personal events, one's visual perception of size and distance of external objects, and the capacity to self-reflect and become aware of one's own identity. To address these questions, we conduct behavioral and neuroimaging experiments with human participants. The static and unchangeable nature of the body poses a particular challenge to experimental research because it makes it difficult to experimentally manipulate body perception in the laboratory setting. We have overcome this obstacle by using perceptual body illusions that enable controlled manipulation of specific aspects of body perception in otherwise equivalent conditions. By studying such illusions, we can learn more about the basic processes that underpin body perception. This information, in combination with the findings of state-of-the-art neuroimaging experiments, can provide important insights into the underlying neural mechanisms. This research has important clinical and industrial applications. The projection of ownership onto external objects represents a new direction in human-machine interfacing, neuroprosthetics, and computer science. To this end, we collaborate with engineers, neurosurgeons, and hand -surgeons to develop advanced prostheses that feel more like real limbs. 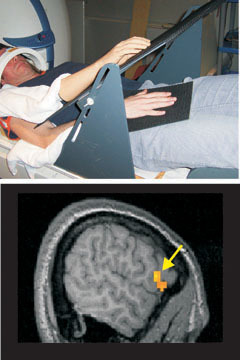 Moreover, identifying the neural substrate of the sense of bodily self has a strong bearing on clinical research into psychiatric and neurological disorders that involve an impaired sense of self and body perception, including schizophrenia, depression, autism, and eating disorders and other body-image disorders. Our laboratory is located in the Department of Neuroscience, Karolinska Institutet. We have a large telepresence lab (with numerous sets of digital high-resolution head-mounted displays, analogue and digital video cameras, and video editing software), a behavioral testing room with physiological recording devices (multichannel electromyograms, skin-temperature recording sensors, a magnetic motion-capturing system, equipment to assess skin-conductance responses and eye tracking, and other devices), and a state-of-the-art transcranial magnetic stimulation (TMS) lab with neuronavigation (Magstim) software. For psychophysics experiments concerning body perception, we have developed a "magic box" setup that enables real-time manipulation of visual feedback from hand movements, and for force-perception experiments, we have developed a motor-based lever system with force sensors. For functional magnetic resonance imaging, we have full access to one 3 T Siemens Prisma scanner at Karolinska Hospital's Huddinge MR-Centre (Head of MR-physics: Prof. Tie-Qiang Li) and one 3 T Discovery MR750 GE Scanner at the hospital's Solna MR-Centre (Head Prof. Martin Ingvar). For fMRI experiments, we have MR-compatible head mounted displays and MR-compatible EMG and SCR recording systems; we are also developing an MR-compatible, pneumatically controlled system for tactile stimulation and control of finger movements. In addition, we have ready access to a state-of-the-art MEG system (Electa Neuromag TRIUX) with complementary physiological recording devices (MEG compatible 128-channel EEG, plethysmography, EMG, ECG, and eye tracking) and sophisticated stimulus-delivery platforms (visual, auditory, olfactory, pain, and somatosensory, including a robot system for tactile stimulation of the hands with high temporal precision). The lab is funded by Ehrsson's two senior grants from the Swedish Research Council, project grants from Riksbankens Jubileums Fond and Hjärnfonden, and strategic grants from the Torsten Söderbergs foundation and the James S. McDonnell Foundation (USA). The lab was established with economic support from starting-investigator grants from the European Research Council (2008-2013), the Swedish Foundation for Strategic Research (2008-2013), and the Human Frontier Science Programme (2009-2011). Our lab received the highest grade ("outstanding; 6/6") in the recent external research assessment of the Karolinska Institutet. This places us in the top 12% of labs at the Karolinska Institutet that received this grade. Page last modified: November 01 2018 16:17:08.